Recognized for its maritime importance by Napoleon Bonaparte, the Port of Antwerp is the second largest port in Europe and fifth largest in the world, and has had a significant impact on European history. Appropriately known as “the Diamond Capital of the World,” Antwerp sees $16 billion in polished diamonds pass through its exchanges each year, with the city boasting an overall turnover of $54 billion in the gemstone. By 2007, however, the Port of Antwerp had outgrown its office space. To maintain the port’s prominence in an ever expanding international arena, the city needed a sustainable, future-proof workplace, with a design that represented the city’s past, present and future. The (late) world renowned Architect Zaha Hadid’s imaginative vision captured the hearts and minds of competition judges, and she was awarded the privilege of designing the new “jewel” of the port. Her challenge was to design an iconic building that was inspirational yet functional – both inside and outside. To achieve this harmony, it was critical that the building’s interior maintain the uniqueness of the superstructure, while meeting very specific functional needs. Hadid effortlessly juxtaposed Antwerp’s past with its future, incorporating its maritime significance as well as its status as the world’s Diamond Capital. The multi-story diamond shaped structure includes restaurants and an auditorium. And, while it currently supports 450 employees, it is designed with the flexibility to grow as a workplace for 600 employees. 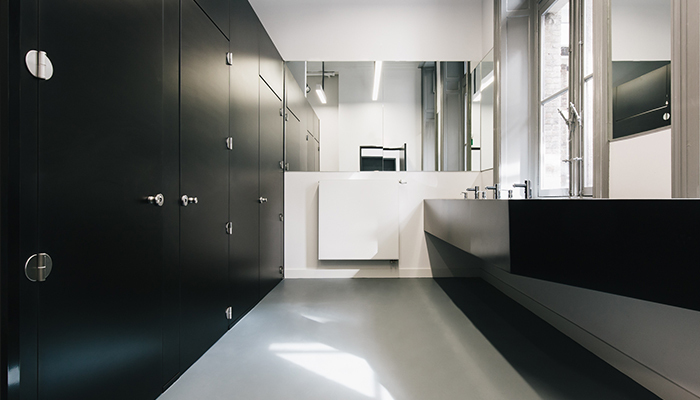 To compliment the iconic structure and allow future workforce expansion, the building needed iconic washroom facilities that guaranteed sophistication, privacy, and the flexibility to grow. 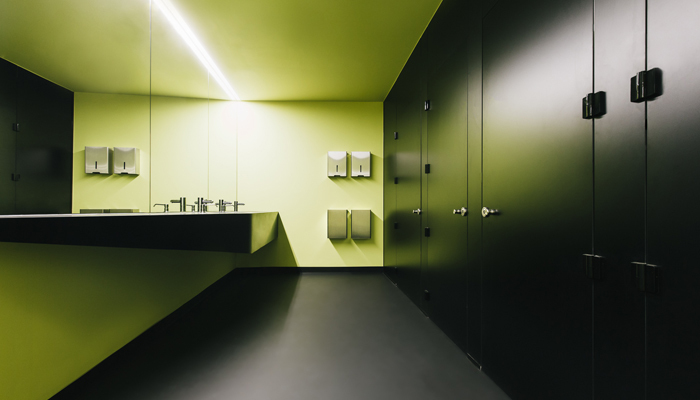 To deliver on these lofty washroom design requirements, Zaha Hadid Architects turned to ASI Alpaco. 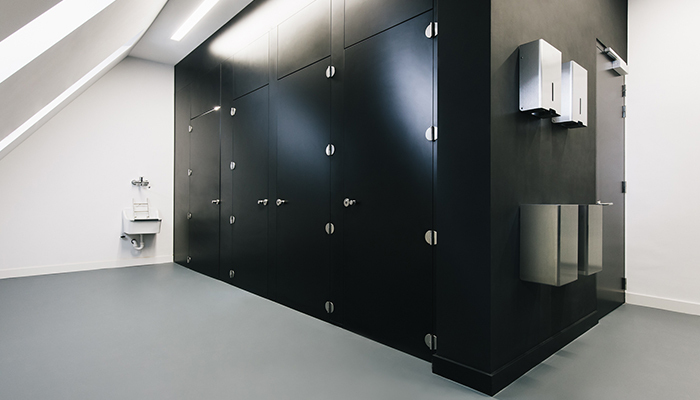 Custom-made, extra-height black Alpaco cubicles provide superior privacy in the stunning washrooms. 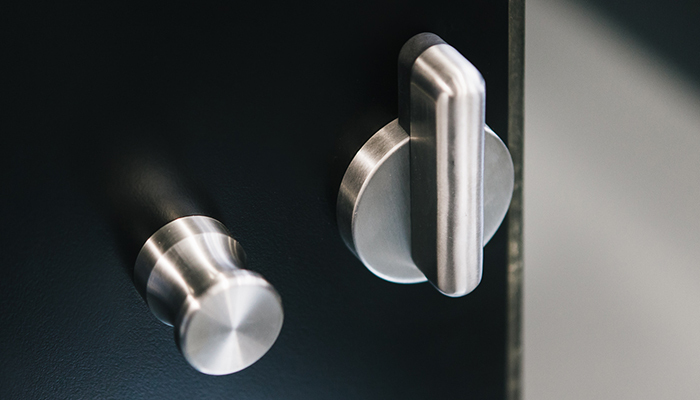 Stainless steel hardware accent the washroom design, adding distinction worthy of the building’s reputation and a touch of modern aesthetics. 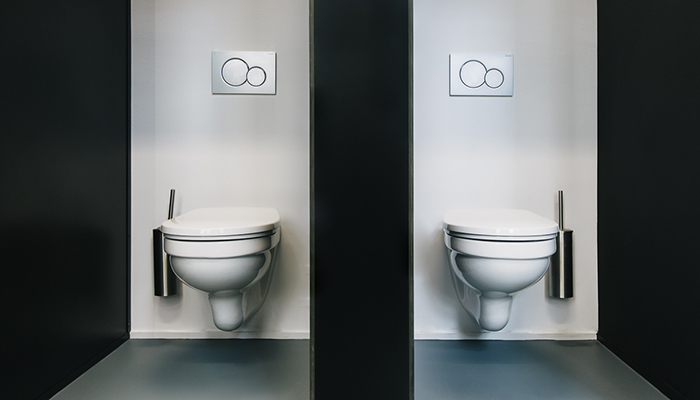 The elegance of stainless steel washroom accessories add sophistication to an already distinct design. Today, visiting trade delegations cannot miss the new Port House, which serves as the headquarters for the Antwerp Port Authority and is considered the “jewel” of the port. “With the new Port House we have given a face to the world-class port that Antwerp undoubtedly is. With its dynamic, ambitious and innovative design it stands as a symbol for our port,” said Marc Van Peel, Port Alderman, President of the Port of Antwerp. The structure blends both the historical heritage of the city with the modernization of the future to create a flagship building celebrating Antwerp as the Diamond Capital of the World. 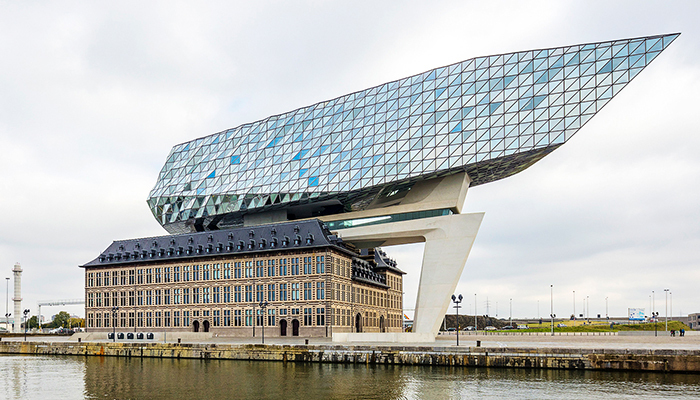 “The new Port House designed by Zaha Hadid is a proud landmark for Antwerp. The striking design gives Antwerp a wonderful architectural jewel that matches its position and importance as a world port,” said Hilde Crevits, Flemish minister of Transport & Public Works.